Help us welcome back Macalester Public Observing Nights with this special viewing of the total lunar eclipse on Sunday, 20 January 2019! We will open the dome at 8:00pm (weather permitting), with the eclipse beginning around 9:30pm. Total lunar eclipse is between 10:45pm and 11:45pm, so stay late if you can! We hope to see you all there. The Macalester College Observatory will host regular Public Nights this spring semester on Monday evenings, from 28 January to 6 May from 7:00 pm – 10:00 pm, during which our 16-inch telescope will be open for viewing and education. 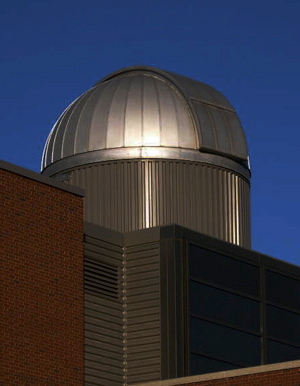 Public Nights is an ongoing student-run event which allows the greater Macalester College community to take advantage of the college’s science-grade observatory. Weather permitting, potential targets include the Moon, Mars, Saturn, other planets, globular clusters, star clusters, binary star systems, galaxies, and planetary nebulae. In the case of cloudy skies, poor visibility, or precipitation, we will not be able to open the dome for observing; however, if you would still like to see the facilities and chat about the universe, our astronomy students will be present to show the dome and answer questions. Hope to see you there! For weather updates, cancellations or other amendments to this schedule, please refer to the Macalester Public Observing Nights Facebook group page at https://www.facebook.com/MacObserving/. To access the telescope, enter Olin Rice Hall via either of the NORTH entrances on the NORTH side of the building, and take the stairs or service elevator on the SOUTHWEST side of the building up to the fourth floor. Enter the first room on the left — you will see a spiral staircase. Ascend the spiral staircase to the roof. The dome is only accessible by this staircase. Please contact Brian Adams at 651-696-6456 for more information.